End of the Semester Evaluations – of Me! At the end of the semester, I always ask students to give me feedback about my course, my syllabus, and the skills of the freakishly attractive woman they have been made to stare at for nearly 400 hours. I ask them to type their answers so there is no chance of being identified by their handwriting. That way I feel like they really do have a chance to give me honest feedback. Basically, it is their opportunity to let me have it. This semester, I started out with 27 students sitting at 27 desks. In the end, I wound up with 13 warriors. Not everyone earned A’s or B’s. But everyone who stayed until the end, showed a kind of tenaciousness that I feel certain will help them succeed in the future. These people were not quitters. Here is a sampling of the answers to the questions I asked. Question 1: What were some of Professor Jacobson’s strengths? Professor Jacobson is exciting, energetic and up-beat. So they liked my singing after all! She’s fun, nice to talk to, understanding, funny and helpful. Her personality makes class much more bearable. Clearly there are many unbearable aspects to my class. She provides constructive criticism during essay writing and praise when appropriate. She always lets students know what’s going on and makes sure everyone is clear on everything. I’m not positive, but I think this might have been a little snarky. One of the things I was worst at was sticking to my proposed syllabus. And I constantly revised it. Question 2: What were some of Professor Jacobson’s weaknesses? Whaaat? This person must have been spell-bound by my dancing. She doesn’t know how to work the projector. At all. There we go. Sad, but true. Technology is my enemy. She kept changing the syllabus around. I didn’t like her emphasis on citation. Sorry. I’m trying to make it so you don’t get busted for stealing in the future. I thought the class was thought out well and the assignments were interesting. Few and far-between. Maybe a little favoritism. Clearly, X was her favorite student above anyone else, thought she did seem to like us all. X was actually not my favorite student. Question 3. Do you feel the expectations were appropriate for a Composition-101 class? Woot! Got 9 of these. But maybe it’s easier to just write “absolutely” than have to elaborate. Hmmm. I thought she had high expectations for her students to become better writers and that’s what she got. At times, it felt like a lot because other teachers hand out a lot of work as well. I was expecting a more relaxed work load, but I won’t complain because writing this much made us stronger and weeded out the slackers. Question 4: Did Professor Jacobson create an atmosphere of respect and cooperation? If so, where was this demonstrated? If no, how can she improve? The classroom setting was super comfortable. She promoted a lot of cooperation during peer review where we read each others’ papers. This was scary at first, but I eventually realized that we were all helping each other and realized no one would ever be cruel. She was a friend to all of us, but strict enough to command respect. She was respectful to us and expected us to be the same to her – and each other. Sometimes I have problems reading aloud, but I didn’t in this class because I knew no one would make a snide remark. 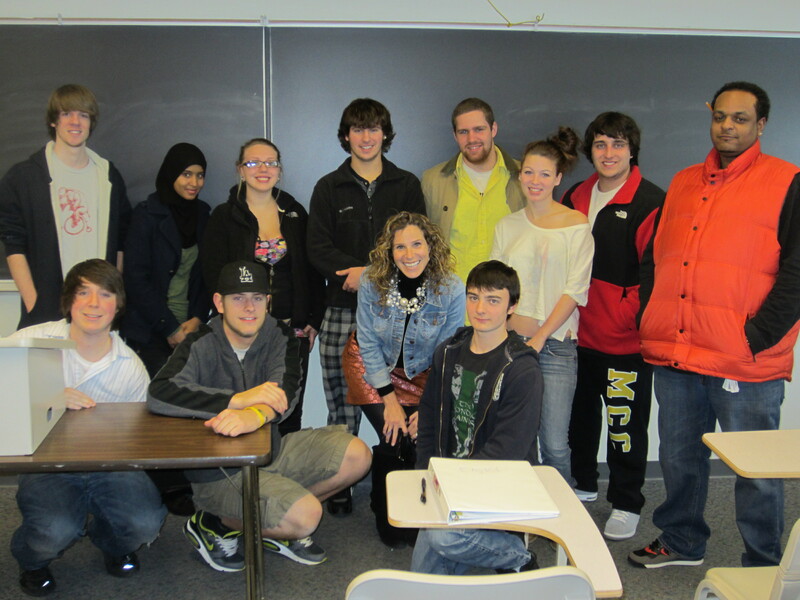 Professor Jacobson’s attitude is what made this section of English-101 a successful class. She displayed respect when she asked people to share their writing without pressuring anyone who didn’t want to. There was a lot of mutual respect. I’m kind of big on respect. Question 5: Do you feel your writing skills improved over the semester? Before this class I had never heard of MLA citation. I had never generated my own thesis statement. Now I know how to do both. My analysis defiantly (sic) became stronger. And my sentence structure has improved and become more varied. We were writing all the time, and the constant practice helped me improve. I actually know where to put my commas now. I learned to weed out unnecessary words. When I looked back at my first paper, there was so much purple all over the place. Now I am making fewer mistakes, and I am enjoying writing more. I asked a few other questions, too. But you get the gist. One comment has to be read in isolation. It was not written in paragraphs. It is what it is. It keeps me humble and reminds me that no matter how hard I try, I can’t reach everyone. 1. I have no idea what your strengths are as a teacher. 2. I have no idea what your weaknesses are as a teacher. 3. I guess your expectations were appropriate. 5. My writing remains the same. Have you ever been evaluated? What have people said about you? Or what do you think folks might say is your greatest strength and your biggest weakness? This entry was posted in Education and tagged college, education, evaluations, Higher Education, students, teachers. Bookmark the permalink. Thanks Rivka. 😉 They were a good bunch. The ones that made it to the end. I always ask my students to evaluate themselves on a regular basis. They are usually surprised the first time I do this. I ask very specific questions about their attitude, study habits, effort, etc. I then ask them to tell me what grade they think they deserve and why. The objective is to get them to develop more responsibility and organization and to be honest with themselves about their own progress. I aim to do this weekly. On the same sheet, I ask them if they have any suggestions for me and how how our class can be better, so they are evaluating me and themselves at the same time. I then respond to what they’ve written and give them a weekly grade, not necessarily the one that gave themselves, but very often they are accurate in their self-assessment. I currently teach high school students, but I have used this method of self-evaluation with both middle school and high school students since the 1970’s. Over the years, I have had a variety of experiences being evaluated by administrators. Those who have known my subject matter have usually been positive while those who had no clue what I was doing tended to be less favorable. I actually value what students say more than administrators, as they are in the trenches with me. Gareth: I have them evaluate and grade themselves in a separate document. I really want them to focus on themselves and the larger lessons they will take away from the class. And you are right, they are generally very honest about their own progress. Many students noted that time management was an issue for them. I wondered how much of their time was eaten up by social media. Anyway, this assignment is more of a perfunctory last-day-of-class-thing because my community college does not always offer formal evaluations, but I always like to see how I am doing. And as you said, I actually value what my students say more than anyone since we spend so much time together. By the way, I’d love to see the assignment you give some time, if you wouldn’t mind sharing. All in all, I think you passed with flying colors! That last comment isn’t a reflection on you, but rather a reflection on the effort one particular student decided to exert towards the class. You can only do what you can do, and if someone makes us their mind that they’re not going to improve or make an effort, that’s not your fault. I love getting evaluated and wish I got more constructive critcism–not just in my job, but with my blog and things in general. I know what you are saying Abby, but it still makes me sad. I mean, I’d rather have a person lambast me and tell me how I was useless (and explain them in detail in the following six ways) than hand in a paper than flies in the face of everything I tried to get them to do this semester. So, yes, I know what you are saying. But I would have liked to have known WHY this particular student felt his or her writing didn’t change at all. Your evaluation questions really gave your students a chamce to tell you what they really thought about your class. Kudos to you for letting them unload their feelings about what they learned and how you taught them in class. You’re a brave woman and a good teacher. I have grown less afraid of getting student feedback over the years. They are the experts. They know my abilities and weaknesses after 42 classes together. I value their ideas and so want to improve for future classes. How can I improve without feedback? Oh, I’m no A+. If you could see me struggling with the stooopid technology every stinking day, you would lower my grade considerably. I am ridiculous. For some reason I can never switch back and forth between the computer and the overhead projector the way I am supposed to. I shouldn’t complain. At least I had technology this year. And no pole in the middle of my classroom. And the folks from Technological Services would come up to my class and fix things within 5 minutes (practically everyday). You know, I’m on good terms with them. I love that you put this out there and I love how to-heart you take your evaluations! I adored my students this semester. I loved listening to their favorite music. And, by the end of the course, as they looked through their portfolios, they could really see how their writing had changed over the semester. They can’t tell until they go back and really look at it all. Their surprise is pretty magical. I think you’re awesome to put it out there like that – for them, for us. A few of my profs did the same at the end of this semester – except, of course, for the one who could REALLY use some constructive criticism – and it DID feel good offer up my real thoughts. I’d love to take one of your classes – bet I’d learn tons! You’d learn that I really can’t use the projector. At all. And I really do sing. Gotta love evals. I didn’t realize that I had to request them at my newest college, so I lost 50 students feedback which I really want when it comes down to getting more work. Hi Clay! Weird, right? My college doesn’t always provide them to teachers either, so I make sure to make it an assignment and request anonymous evaluations so I can figure out which assignments they liked (I didn’t include all that here) and which assignments or parts of assignments didn’t work. I got some great feedback about the research paper. They felt they had ample time, but I really need to figure out a more modern way to get them to keep their notes together. I learned how to teach research papers by taking copious notes on note cards which were attached to Bibliography Cards. These students don’t like that method and frankly, I don’t blame them. With so many of their sources coming from online databases, and with citation easily generated by automated citation sites, well… I have to rethink that part of the process. For sure. I need to see how some other Comp-101 teachers do this. Because my sense is that if they don’t collect information properly, they can easily unintentionally plagiarize. And that is not good for anyone. That was so fun to read the comments people made about you. I have never been in a position to be evaluated like that. I think I need to take your class… I’ve never taken a writing class, nor know how to do a MLA citation or generate my own thesis statement! Great blog–no comments. Absolutely. Liked. Yes. LOL. Some of my professors received evaluations from me that were similar to your last one. Simply put, I was done and had no interest in spending any more time writing for them. It really wasn’t a reflection on them as much as my own desire to begin my winter/summer break. I use zoomerang and make online surveys for my students to do…some questions quantitative, some qualitative, all anonymous. It’s always amusing, always educational. And those are amazing results you had! And no, I’m not surprised. I know this is not AT ALL the point of this post, but I have to say you are SO ADORABLE in that picture . . . truly a teacher hottie! Anyway, those are great answers! You should feel good. Even that slight ouch at the end is really more of a reflection of the writer . . . he/she seems angry, but not about YOU per say. I really enjoy reading your blog and find you so refreshing. Please never stop writing! 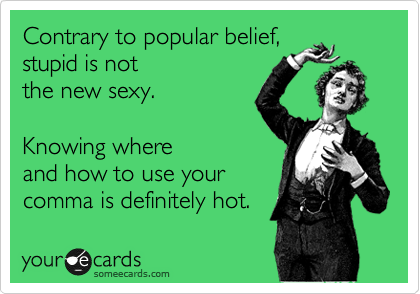 Okay, first of all, that someecard is amazing (LOVE THEM!). Second of all, I’m pretty sure you must be one of the most kicka*s teachers of all time, and clearly I’m your favorite student. Jules! I’m glad you like my original someecard. I’m not one for taking other people’s shizz. As you know. As far as being a kiss a$$* teacher, I do my best. And clearly, you are my favorite student. Duh. **Thanks to Kei$ha for letting me write that word without really swearing.